Other Work: Interior alterations made in 1985, 1986, 1989, 1990, 1991, 1992, 1993, 1994, 1995, 1996 and interior and exterior changes made to the library parkade in 1991, 1992 and 1993. Extensive renovations and an addition completed in 2005. 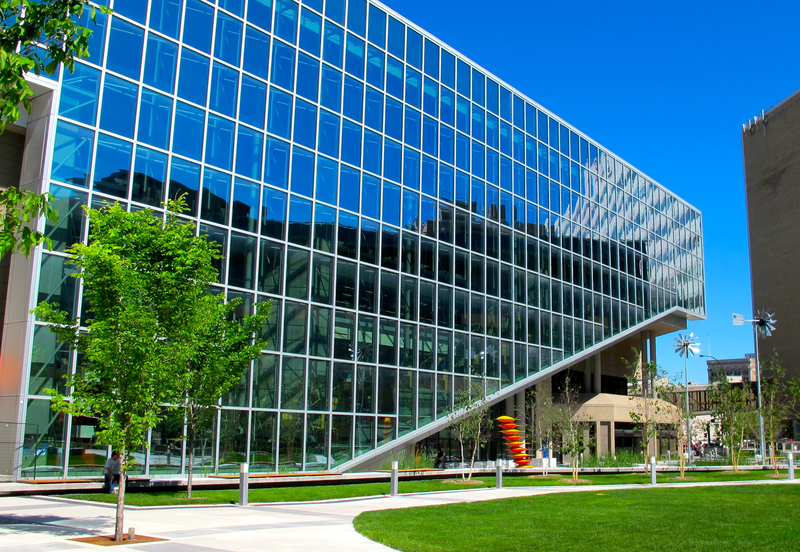 Opened on March 17, 1977 by Premier Ed Schreyer, the Centennial Library was colloquially referred to as “Winnipeg’s gift to itself” in celebration of the city’s 100th birthday. Originally designed by architects Ward, MacDonald, Cockburn, McLeod and McFeetors, the project had a dedicated mission to enhance readers’ services and revitalize the downtown area. 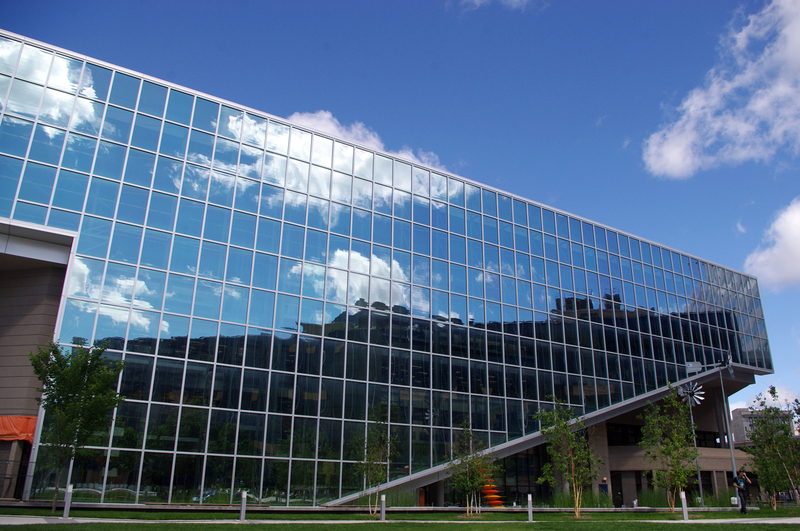 The Centennial Library was originally designed as a three-storey masonry and concrete structure integrated with an underground parking garage and a landscaped garden on the south side of the site. The sweeping design features a spacious plan with open stacks and abundant natural light. On the exterior, its aggregate precast panelling is respectful of the established buildings nearby. 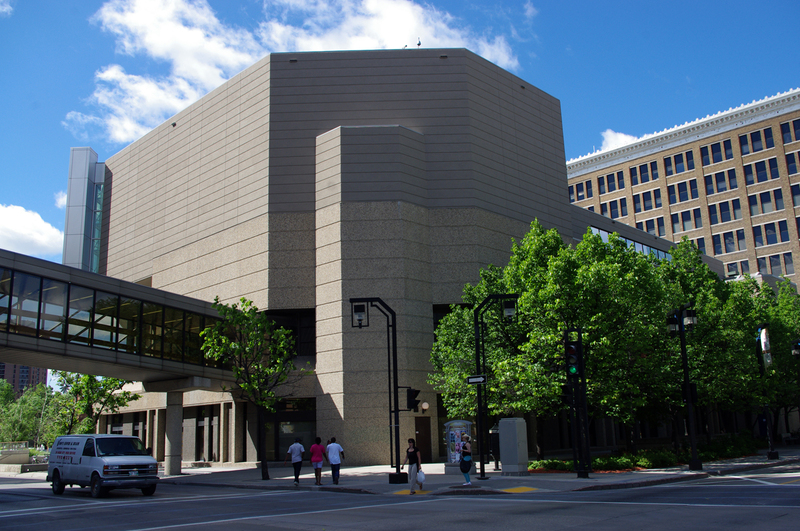 By 2000, the library needed renovation and expansion to provide for new technological services and expanding collections. Patkau Architects of Vancouver joined local firm LM Architectural Group to design an award-winning expansion and renovation project that added a fourth storey, a multilevel reading terrace and a four-storey glass curtain wall overlooking the garden. As part of the grand opening of the renovated building in 2005, two major works of art were installed through the City of Winnipeg’s new public art programme: Untitled (2005) by local artist Cliff Eyland and The Illumination by Lethbridge, Alberta artist Nicholas Wade. 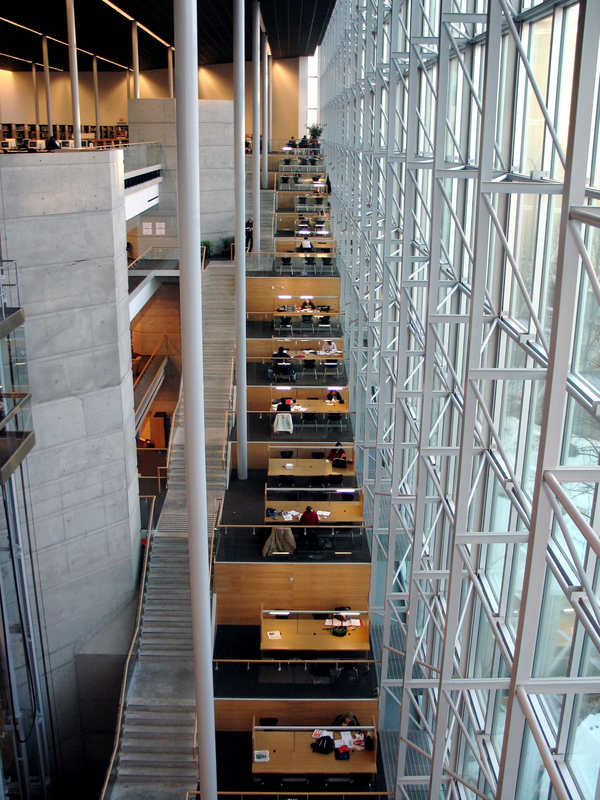 The renovation reopened as the Winnipeg Millennium Library. 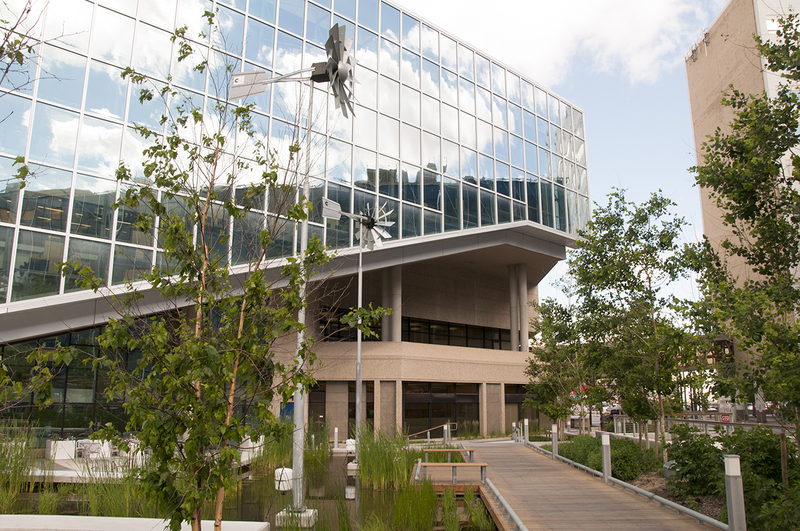 In 2012 the rear of the site, Millenium Library Park, underwent further renovation to include a revised landscape and two public art projects: emptyful by Bill Pechet and Sentinel of Truth by Winnipeg artist Darren Stebeleski. 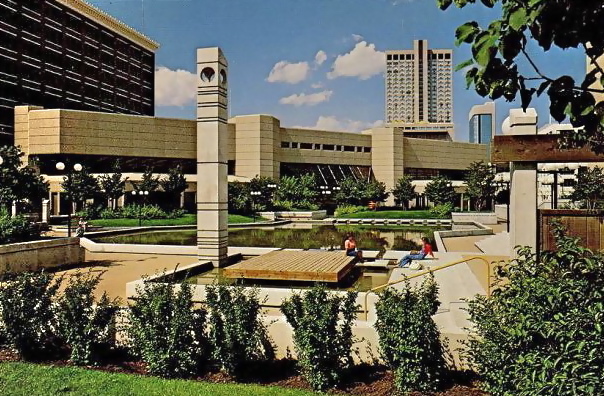 The original park plan, by Lombard North, was composed around a large open area featuring an angular concrete pond; more intimate seating areas were set closer to the building, as was a smaller pond somewhat hidden by trees and shrubs, waterways, a fountain and walkways. At the centre of the smaller pond, still a highlight of the park today, is a bright orange and yellow abstract sculpture by Manitoba artist Tony Tascona. In the original scheme, adjacent to the main pond stood a raised area housing a concession booth intended as a home for performances and presentations. 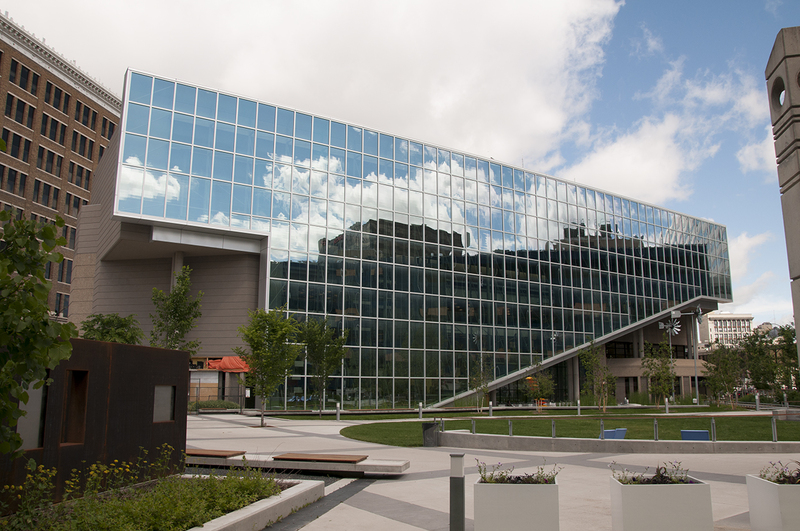 The landscape architects of the original park advocated for the reversal of the overall site plan, assuming that the space would receive more visitors if it were located by the building's main entrance. Recent alterations have included the addition of an entrance facing the park. Library plan Area (before addition): 45,552 sq. ft.
Parkade plan area: 93,943 sq.ft. Dee Buchwald and Abe Anhang, 'Library expansion into park justified,' Winnipeg Free Press, February 29, 2000, p. A11. Carol Budnick, 'Libraries in early Winnipeg,' Manitoba Library Association Bulletin (September 19800, pp. 12-17. Bill Burdeyny, 'Courtyard is more for looking than using,' Winnipeg Tribune, May 2, 1977, p. 2. Carol Colliver, 'Excitement mounts over library,' Winnipeg Tribune, January 31, 1974. Linda Cooke, 'Centennial Library already a success,' Winnipeg Tribune, June 2, 1977. Marjorie Earl, 'Space-age colours a help,' Winnipeg Tribune, February 17, 1977. Kim Gutterson, 'Library for the future,' Winnipeg Free Press, Auguts 11, 1997, pp. A1, A2. Kim Gutterson, 'Library plan hits up city for $1.4M,' Winnipeg Free Press, May 19, 1998, p.A3. 'Library makes room for walkway link,' Winnipeg Free Press, April 16, 1986, p.35. Debbie Lyon, "Library moves to new quarters without a hitch,' Winnipeg Free Press, February 24, 1977, p.23. Debbie Lyon, "Thousands of book buffs head downtown to check out the new Centennial project,' Alumni Journal (University of Manitoba) 35, 3 (Spring 1975), pp. 8-9. Lynne MacFarlane, "Better Late than Never -- The New Winnipeg Library: A Centennial Project, " Alumni Journal (University of Manitoba) 35, 3 (Spring 1975), pp. 8-9. Heather Menzies, "Library has become more than modern book house," Winnipeg Tribune, September 24, 1979, p. 10. "Plans for Centennial Library unveiled at civic meeting,' Winnipeg Tribune, May 22, 1974. Bob Silver, 'Millennium library key to our future,' Winnipeg Free Press, July 13, 1999, p.A9. 'Some projects will proceed -- despite tight money," Manitoba Business Journal, 6, 3 (March 1970), pp. 30-31. Morley Walker, 'Bag-Lady library,' Winnipeg Free Press, June 6, 1999, pp. D1, D2. Val Werier, ' A haven in the halls f concrete,' Winnipeg Tribune, October 29, 1976, p.8. Val Werier, 'Centennial Library is too successful,' Winnipeg tribune, April 29, 1977, p.8. Val Werier, 'Library a setback for setbacks,' Winnipeg tribune, July 5, 1974, p.6. Val Werier, 'The most attractive place in town,' Winnipeg Tribune, March 12, 1977. 'Winnipeg Centennial Library,' Winnipeg Industrial Topics, 36, 6 (December 1976), p. 3. 'Winnipeg opens its birthday gift,' Winnipeg Tribune, March 17, 1977, p.4. City of Winnipeg Archives, Minutes of the City Council. Copies of the invitation and official program for the May 4, 1977 opening of the library can be found in the Winnipeg Public Library verticle files at the Centennial Library ("Winnipeg Centennial Library to 1979"). University of Manitoba Libraries, Archives and Special Collections, Winnipeg Tribune Photograph Collection. Includes views of the site, excavation and construction photographs in "Preliminary Inventory -- Jeff Debooy/Tribune Negatives," 1975-77 and in "Peter Tittenberger Photograph Collection of the Winnipeg Tribune Negatives," 1974.